Yarn: 100 (115) yds heavy worsted To celebrate the 10th anniversary of their shop, Churchmouse Yarns stirred together a few of their favorite things: cables, tweed and tea! And just to be a little eXtra clever, they made sure to sneak in 10 (X!) little X-ing cables. Every home needs a Brown Betty. 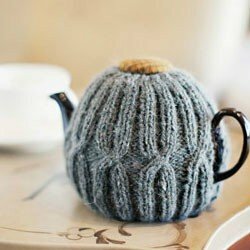 And every teapot needs a tweedy cozy!